Physician Rose Anderson came to Eternity Springs to reconcile with her estranged sister Sage (Hummingbird Lake, Book 2) and ended up making the town her home and becoming a vital part of the community. Happy that her sister is now one of her best friends and with the knowledge that her contribution is important to a town she has grown to love, Rose nevertheless, is bothered by feeling like the proverbial old maid auntie now that her sister and so many of their friends are married and producing progeny. Baggage from the past keeps Rose from believing she will ever find her own forever hero, but Hunter Cicero and his young charges may change her mind. Glass artist Hunter Cicero grew up in foster care with his only long-term relationship that of chosen sibling with another child in foster care. When Jayne, his sister in all but biology, is diagnosed with cancer, Cicero does what family does in a crisis—he is there. He leaves his studio on Bella Vista Isle for Galveston to support Jayne with his presence, by helping with medical bills, and by caring for her four children. Jayne seems to be beating the disease when an infection that her compromised immune system can’t fight takes her life. Devastated by her death, Cicero is still relieved that guardianship of the four children rests with Jayne’s childless sister-in-law and her husband, leaving Cicero to remain a devoted uncle. He feels ill equipped to have sole responsibility for the children, and he needs to concentrate on his new business endeavor in Eternity Springs with his former apprentice, Gabi Romano so that he can pay his sister’s remaining medical bills. But when Jayne’s relatives by marriage change their minds, Cicero knows he can never let the children he loves go into foster care, perhaps to be separated. When rambunctious Keenan, Cicero’s nine-year-old nephew, breaks his arm, Rose is the doctor on call in the emergency clinic. What begins as a spark of attraction between Cicero and the woman he calls Dr. Delicious quickly grows into feelings deeper than either party expects. But just when the couple, with four kids in tow, seems headed for happiness, complications shatter their idyll. Rose must learn to trust Cicero without reservations and Cicero must believe he is enough on his own before these two wounded people can claim their HEA. Teardrop Lane is the ninth book in Emily March’s Eternity Springs series, and it has the warmth, the sense of community, and the family dynamics that have characterized this series from the beginning. Although the book can be read as a standalone, readers familiar with the setting and characters doubtless will have a deeper understanding of the characters and the special place that is Eternity Springs. Rose and Cicero are sympathetic characters, an unexpected pairing perhaps but one that the reader will root for from the beginning. The four children are appealing, and although Daisy is mostly predictably adorable, the three older ones are each distinct personalities: nine-year-old Misty, a bookworm overburdened with a sense of responsibility since her mother’s illness and death; the irrepressible Keenan, who hides his insecurity beneath mischievous behavior; and Galen, a four-year-old determined to catch up to his big brother. This is their story too. 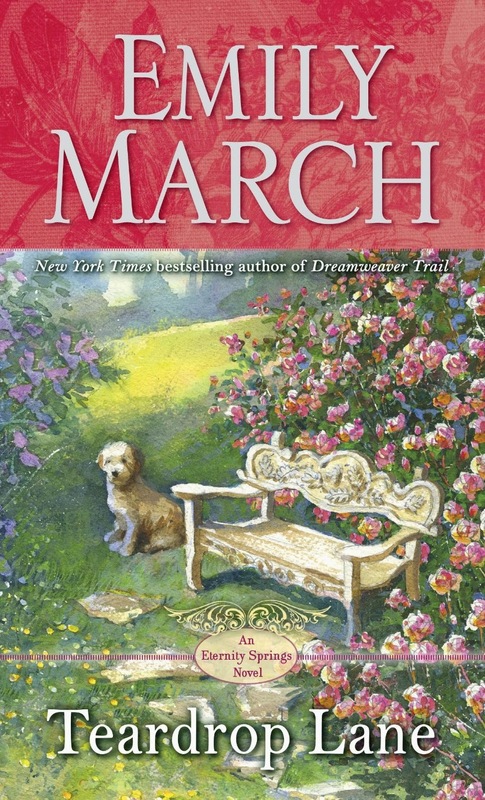 I’ve been a faithful reader of this series since the first book, and I think March has done a remarkable job of giving readers consistently good stories, maintaining a difficult balance between making each book fresh and including sufficient familiar characters to connect each book to the established pattern of the particular place. I rank this one with the strongest books in the series. Readers who dislike children in romance novels will find less to waken their enthusiasm, but those who enjoy believable kids in a heart-tugging situation in addition to a romance that is sweet with a degree of sizzle should like this novel as much as I did. Skeptics may scoff, but those who believe in magic will approve. I also particularly liked the fact that Cicero is an artist and that one scene involving his art shows more clearly than words ever could how deep his love for the four children goes. That he draws inspiration from a poem by a poet whose work is an endless joy for me is the icing on a blue-ribbon cake. I keep promising myself to read this series, and never get to it. I have several of the books already. I do like children in stories. They add another dimension to the story, help show the character of the others in the story, and can throw a monkey wrench into things. Thanks for the review. Thanks for the review, Janga. This is also a favorite series of mine. I love how Emily March builds the stories and the community through the series.